As many of you know, I am taking part in a gap year immersion program called Global Citizen Year. 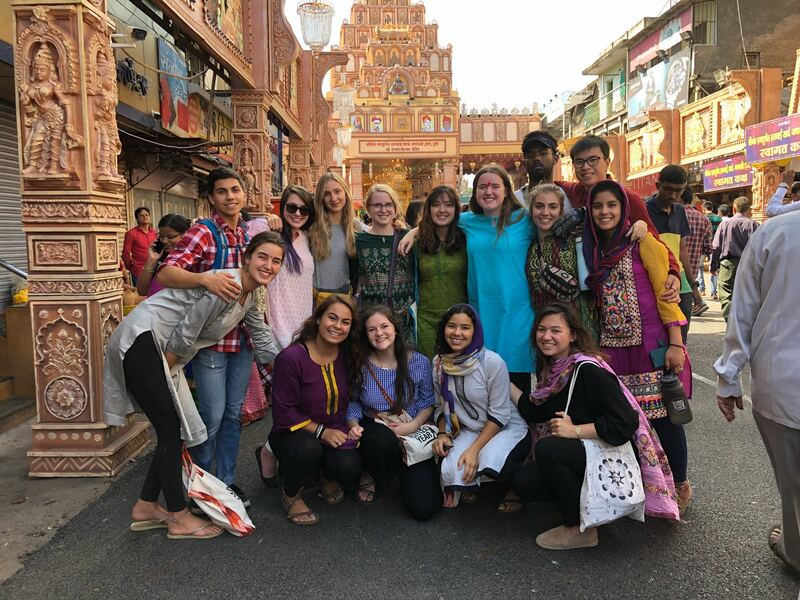 It involves living with a host family for 8 months, and apprenticing at Teach for India, an education non-profit. When deciding what to do for my gap year, it was such a tough call whether to do a program or independent travel as I’m used to. I wanted to push myself to really grow as a person this year- spiritually and emotionally, so I knew I would need some guidance, and that’s where GCY comes in. In the first week or so, India had made quite an impression on me. However, first impressions can be quite deceiving, as I’ve found it as time went on. I went into this trip hoping to have no expectations, and therefore no disappointments and lots of room for growth. However, I’ve learned to hold some expectations for myself, such as curiosity before judgement, and that has allowed me to debunk some of my first impressions. As soon as we stepped out of the Pune Airport, I saw people everywhere. People and cars and shops and things, seemingly in places they didn’t belong. We boarded our bus and got some flowers and then headed off to CDSA, where we’d be spending the first week. When we got there, we trekked up a muddy hill. Throughout the first week, we had sessions about India, language learning, and lots of meditation. Schedules were constantly shifting and people were late. All of this led me to believe that India was disorganized. However, I quickly made a distinction between disorganized and organized differently. My host family asked me if I thought India was disorganized the other day, and I had come to realize that I no longer felt this way. Nothing was on time, that’s true, and people, cars, and animals are everywhere, that’s also true, but it works for them. It’s not the westerners way, but it is the way it is, and I’ve adapted to looking 6 ways when crossing the road and expecting things to start a few minutes later than scheduled (good thing too, because I’m rarely on time). If you have the mindset that India is disorganized, you’ll always be frustrated that things aren’t the way you’re used to, so I let this impression go. Pune is a city with 3 million people in it, and it feels like there is just as many rickshaws as that on a single street honking at times. There is always a stray dog barking in the distance, or a person singing, or people chatting. In other words, it is never silent. The first week, I could hardly stand it. I craved some peace, and I found some. CDSA is a center on the outskirts of Pune, but even there we can hear the endless traffic. However, there were also countless green trees and flowers and birds. So I recreated my definition of peace, and it didn’t involve utter silence. Living in a city like this means you have to live with noise, because I can’t dispute the fact that India is loud. I learned to live without silence, and appreciate even more the moments where I find a quietness rare in Pune. Eventually, I stopped craving the quiet, and let this impression go too. When I arrived at my host family in my second week, I knew that I would fit in well here. A few days in and we were celebrating Ganesh Chaturthi, a festival celebrating Ganesh, the Hindu god of prosperity and wisdom. Temples are erected and idols can be seen in every home, complete with a set of daily rituals and offerings. He stays for 3, 5, or 10 days, depending on the home, before being immersed in water on the last day as he returns to the elements that created him. Pune is the birthplace of this festival, so believe me when I say it was big. On the first day, we went into the city to see the main temple procession as Ganesh was placed, which involved carts pulled by colorful ox, lots of marigold flowers, drums, and singing “Morya!”. Afterwards, I went home and my host family and I set up our own idol, sang a prayer, ate some moduk (Ganesh’s favorite food! It’s a coconut dumpling! ), and then went to the extended family’s house to do it all again! Some family’s idols are way more extravagant than ours was, but they all are there to honor Ganesh. On days 3-5 of the festival, the women get together as it’s believed that Ganesh’s sisters come to visit him on these days. My family stopped celebrating on Day 5, but most of the city continues until the 10th when a procession brings Ganesh back to the water. It is a truly beautiful festival. It also led me to believe that India is a very religious place, but the really cool thing about the Ganesh festival is that it isn’t just celebrated by Hindus. It was created to unite all people despite caste or religion during the British rule, and it still remains a festival for all people. I dropped my impression of religious, and decided it was much more of a beautiful spiritual tradition. The festival unites family, friends, and strangers, and I think that makes it so much more than a religious holiday. The first time I walked into the Pune city center, I noticed trash. It was everywhere, on the streets, in the rivers, on sidewalks. I carefully stepped around it and went about my day. As time went on, I became less and less aware of it, and more aware of how hard Pune is trying to combat it. The Green initiative can be seen all around Pune, from the paper straws, to wooden spoons, to the banning of plastic Ganesh idols in the city. I didn’t think I would be able to find a peaceful, clean park in the city, but I was so wrong! There are so many beautiful green spaces in Pune, and the Pune Okayama Friendship Garden is definitely on the list! It is so quiet and gorgeous, and it’s right near the city center! I also learned more about single use waste products, such as food packaging and toiletry packets, that are made specifically like this so they can be cheap and easily accessible to lower income populations. I dropped my impression of thinking India was dirty because I could see all the progress it was making in this field as well. The main thing I’ve learned in India so far is that first impressions can be completely false- and set a dangerous precedent. If I held on to any of these impressions, I would be forever frustrated that India isn’t living up to my expectations. By letting them go, I am opening myself up to new experiences and allowing myself to enjoy India the way it is today. I started my apprenticeship this week, so stay tuned in the next blog post to the ups and downs of working in an Indian government school! It has been eye-opening to say the least, and it’s only been 4 days! Previous A Summer Well Spent in Germany!